My son and I 'rented' a plot of land for gardening and spent a few hours last week tiling up the land and building a border. Our plot measures around 10x12 and is plenty big enough for our needs, we are so excited. Over the last few years we have always lived in apartments and condos, with no land to plant our own garden. 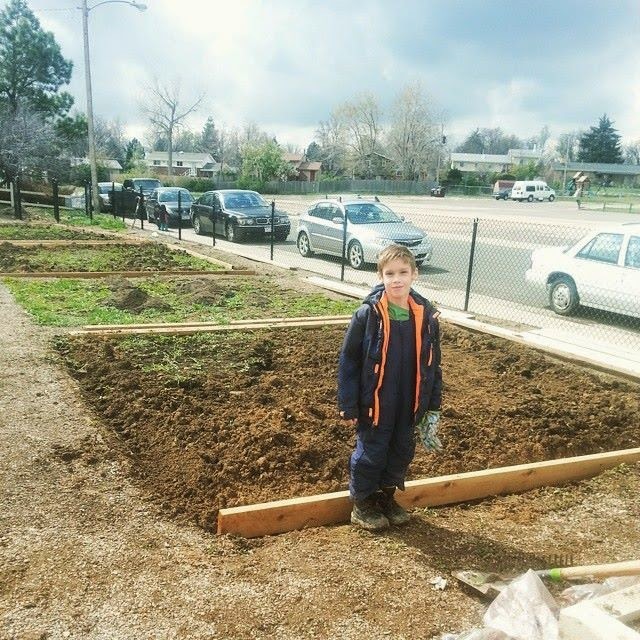 So I did a internet search and found a local Highschool that rents out these garden plots for families. Its a new garden and so much work needs to be done, but we believe it will all pull together. I have been educating myself on how to garden and what should be done for soils that have not yet been planted in, with more clay then not and found so many helpful tips and ideas on Pinterest. The site is loaded with fantastic information. I feel a little more confident doing this. 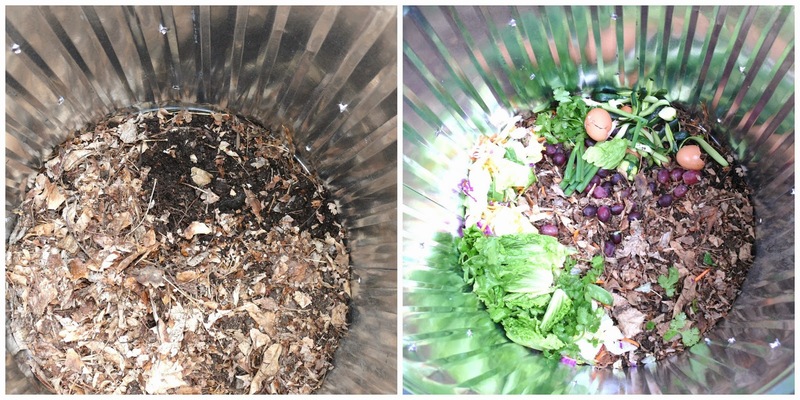 One of the main things that sites kept pushing and saying was to use your own "compost" for your garden and that homemade compost is like Gold to gardens. 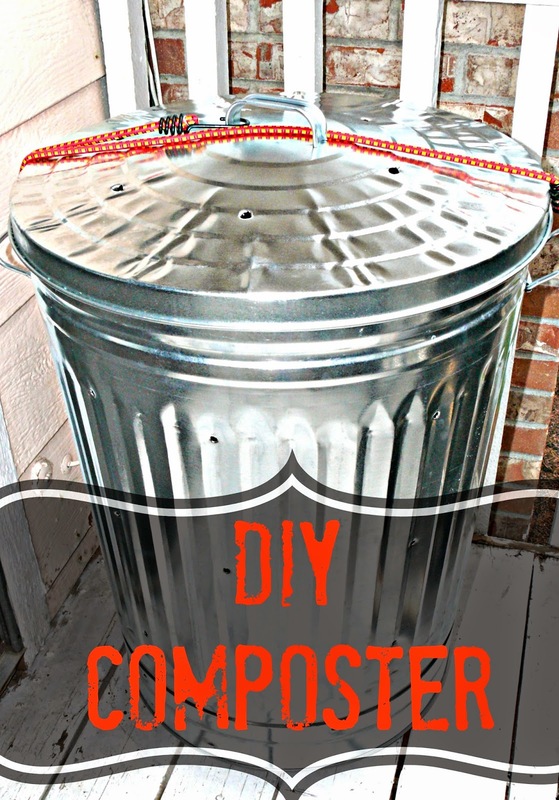 So I decided to tackle the project of a DIY Composter. We needed one that was condo friendly, one that could easily sit on the front deck. After reading around a little it was suggested to use a metal trash can to help keep rodents out and from chewing to get to the goodies inside. I found ours at Walmart for 14$. I was doing a online search for the prices of composts and they are very pricey, doing it yourself saves you hundreds of dollars. I started off by drilling holes through the metal, this took a rather large bit to accomplish. I had Caleb's grandpa do this step for me and I helped hold the can down. You basically just want to scatter holes all around the sides, top and bottom so the soil can breathe. Then add your first layer of leaves/hay/Brown material to the bottom and then add in some soil/dirt to the top of that. This dirt doesn't have to be special because its going to be re-worked with the composting process. Once you have the tow added you can start adding in your kitchen scraps to the top, anything green leafy, eggs shells, peels etc. There are some good lists out there that let you know what is good and not for composting. Once you add in the scraps give it all a good stir and mix it all together and mist the top of the soil with water to activate the process and put the lid back on. Let it do its thing, you will have some good compost in 4 weeks. I plan on taking ours to our Garden and sifting into the soil for our fall planting. This is awesome, and it's perfect. People don't realize how easy it is to compost. And you DIY is so easy! Its super easy, add scraps and let it do its thing!